I’ve been to the cinemas twice now to go see ‘Big Hero 6’. It certainly pales in comparison to the aforementioned 11 times I saw ‘Wreck-it Ralph’ in cinemas as I mentioned in my last post, and doesn’t quite measure up to the 3 times I saw ‘Frozen’, but it’s a good sign for any movie when I’m willing to see it more than once. Right off the bat I’ll say that it wasn’t as compelling for me as either of Disney’s previous animated releases. I don’t hesitate when I say that it’s a great movie though. Big Hero 6, in a lot of ways, is more a product of this current age of western animation than any major Disney releases these past few years, however in some ways it turns out not to be quite the product of the current age that it perhaps intends to be. Big Hero 6 is set in San Fransokyo, an absurd yet wonderful futuristic amalgamation of Tokyo and San Francisco that only Disney could pull off with such vibrancy and vastness, and revolves around Hiro Hamada, a somewhat bratty but brilliant 14 year old prodigy who spends his time bringing in cash with illegal “bot fights”. Thanks to his brother Tadashi, Hiro gets a chance to allow his talent for developing robots to flourish at the San Fransokyo Institute of Technology. After being accepted into the institude thanks to his invention of ‘Microbots’, mini robots controlled telepathically that can combine to do literally anything imaginable, a freak accident results in the death of his brother. Following the realisastion that someone has taken the microbots themselves for their own personal gain, Hiro goes after the perpetrator with his brother’s Robot, a charmingly awkward robot programmed to diagnose and treat health issues named Baymax, and his brother’s close friends from the Institute. 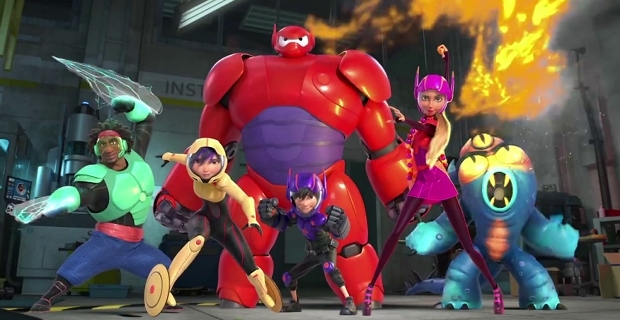 These characters make up a solid dynamic with some strong chemistry, most notably Hiro and Baymax. Hiro isn’t always the most socially adept character in this movie, so when he struggles to be direct with the totally socially oblivious Baymax the results can be hilarious. Baymax individually is almost certainly the funniest part about the movie. One of the best gags of the movie would be when you watch Baymax slowly and awkwardly tape up the holes in his body at the Police Department while the only sound that can be heard is the squeaking dry noise of him deflating. Scott Adsit’s half-monotonous half-organic delivery is also spot on. When Baymax nonchalantly proclaims “I CAN’T RUN FAST” or makes the ridiculous noise coming off of a fist-pump that can best be articulated in text best as “BALALALA” you’re almost certainly bound to hear a cinema full of laughter from every person of every age, as you are with many other Baymax gags. Adsit’s delivery also makes Baymax a sympathetic character when he needs to be. Baymax carries sentimental scenes even better than he does humorous scenes. You can get behind the moral righteousness of Baymax and you can connect with him as a catalyst for Hiro to develop a greater sense of morality beyond his teenage impulses. 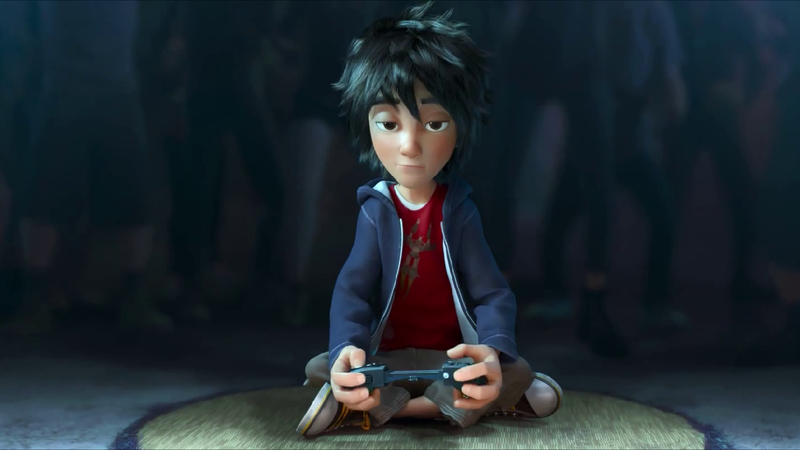 Hiro’s development in Big Hero 6 shows off what is the movie’s biggest strength and it’s most crushing weakness: its moral and emotional nuance. 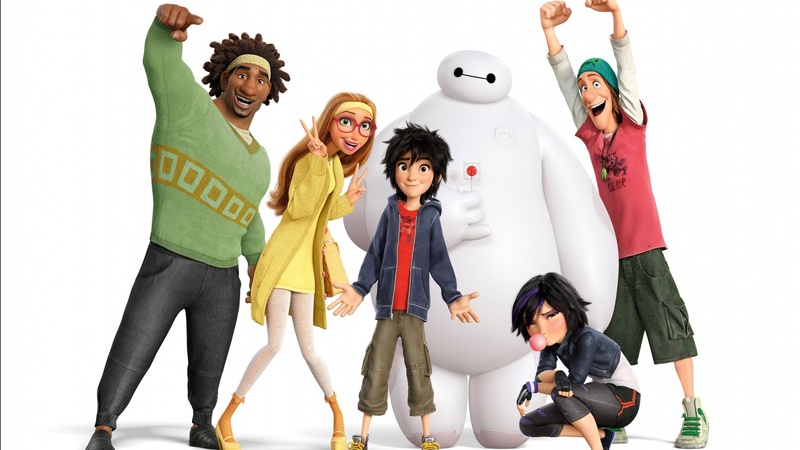 For the most part Big Hero 6 delivers something that has much more direct appeal to an older audience. Western animation is developing to have a much broader audience within the older demographics than they ever have. Shows like ‘Adventure Time’, ‘Regular Show’, Disney’s own ‘Gravity Falls’ and of course ‘My Little Pony: Friendship is Magic’ have huge teenage and adult audiences. Since Frozen’s utterly massive success with every single demographic Disney have most certainly caught on to this, and it shows in many ways in how Big Hero 6 is conceptually and thematically strong. It’s not exactly asking tricky questions, but its protagonist and its villain are both motivated in similar ways to exact revenge, with Hiro eventually overcoming that desire and Callaghan being consumed by it. However, what I *didn’t* like about that is how it failed to remain consistent with that idea in the final moments of the film. Callaghan’s daughter is rescued from the portal, his daughter being trapped in there being what fueled his evil desires, and yet Callaghan doesn’t appear to even be the slightest bit grateful that his daughter survived and just looks on sadly. Although his actions weren’t sympathetic, his motive was, but at that moment Callaghan dissolved into nothing more than a foiled super villain. You can interpret that scene differently, but the rest of the movie doesn’t help that interpretation. Hiro rebuilds Baymax, who was destroyed in the climax of the movie, and he apparently does so without considering using Baymax for his brother’s intended purpose to have him be of benefit to the health system, instead caring only about having his robot sidekick back to be a superhero. In those last few moments Big Hero 6 loses a good chunk of credibility for telling the mature narrative it did. Tadashi’s death seems no more meaningful than a tragic superhero backstory, Hiro’s development seems no more valuable than “with great power comes great responsibility” and Big Hero 6 become just another team of superheroes to market to hell and back like The Avengers and the Guardians of the Galaxy, only less violent. I almost feel like Ralphie finding out that Little Orphan Annie’s secret message to her dedicated fans was to drink more Ovaltine. Well, that last paragraph ended on a pretty cynical note, but let me make it very clear that I very much liked Big Hero 6. I laughed, I grinned and I bought into it emotionally even if a part of me says it was all for nothing. Even though it wasn’t consistently as imaginative or gorgeous as Wreck-it Ralph or Frozen I still loved just about every moment that laid before me on the silver screen. I would like to see Disney’s next big thing appeal to slightly more mature sentiments like Big Hero 6 did while remaining consistent to the end. Either way, the future for western animation is bright. More and more teenage and young adult eyes are being brought to it, and it’s lead to an industry that’s become more creatively ambitious. I hope to see the trend of earnestly broadly appealing cartoons continue much longer.